FileAccessErrorView is a diagnostic tool for Windows that displays information about errors occur while programs running on your system try to open/read/write/delete a file. It displays the filename that the application tried to open/read/write/delete, the process id/name of the application, the error code (NTSTATUS code), the description of the error code, the number of times that this error occurred and the timestamp of this error. How to extract: Download the ZIP package and extract to a folder of your choice. Launch FileAccessErrorView.exe. 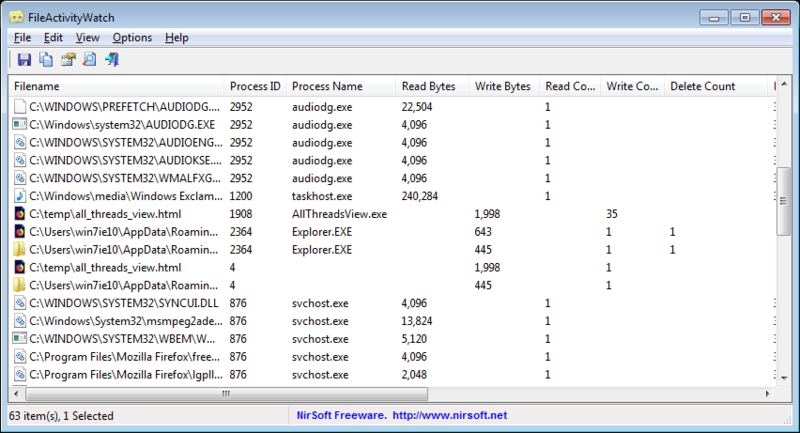 GUIPropView displays extensive information about all windows currently opened on your system. All top-level windows are displayed in the upper pane and, when selected, the lower pane lists selected child windows. Controls include the ability to select one or more items and close, hide, show, minimize, maximize, disable, enable etc. You can also click-and-drag the targeting object to point to identify and select a given Window. Window listing and status details can be exported to a text file or HTML report. How to extract: Download the ZIP package and extract to a folder of your choice. Launch GUIPropView.exe. Fixed bug: clicking the column header of the lower pane (child windows) sorted the column of the upper pane.